Come experience the thrill of offroad adventure on one of our 4x4 all terrain vehicules. 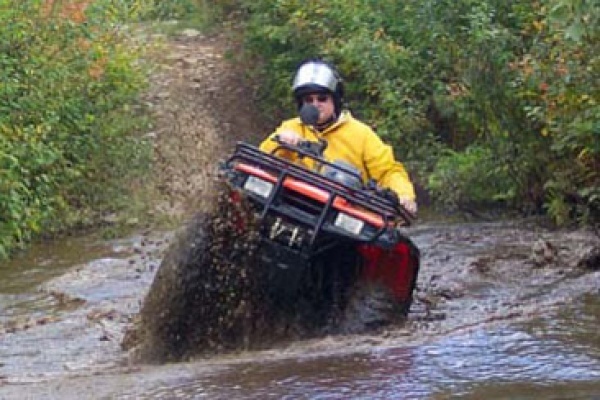 Tackle rocks, mud, water and snow on these powerful machines. Honda FourTrack 350cc and Bombardier TraxterMax 500cc ( 2 person model ) are the best machines available ensuring you have an unforgettable experience ! We have several departures throughout the day, and offer 2 hours tours as well as half day and full day excursions. All tours are lead by one of our experienced guides, includes gas and oil, helmet, protective clothing, boots and gloves. We offer personalized service for every one from beginners, to seasoned riders. We have access to numerous trails, lakes and stream crossings, and the views are breathtaking. Signs of wildlife abound as we follow a forestry road up to Lac En Coeur, here we can take a dip off the dock on hot day. Conditions: Reservations are required. A valid driving license is required. A credit card deposit of 2300$ is required to cover damages. Minimum age of 21. Show time is 30 minutes before the scheduled departure. Fuel and oil are not included for the full day excursions.